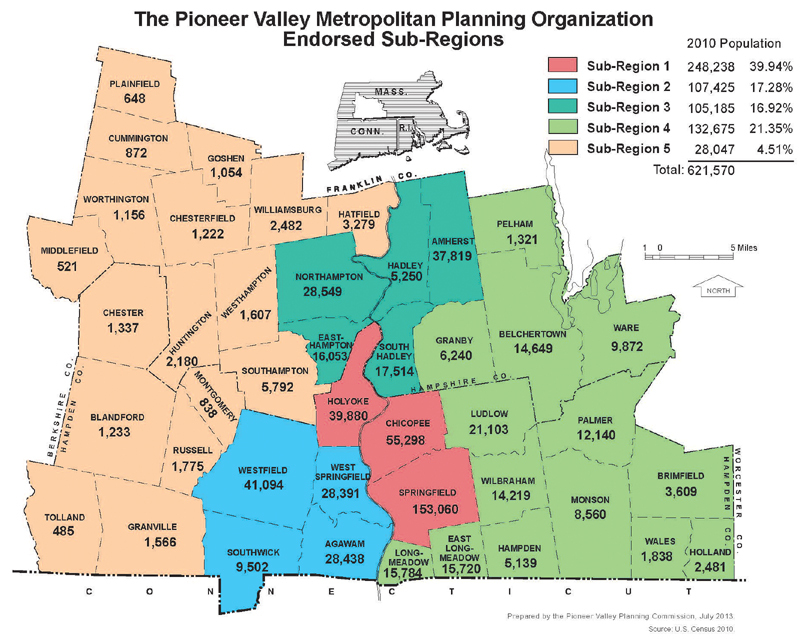 Pioneer Valley Metropolitan Planning Organization (MPO) is the body which approves federally funded projects in Hampshire and Hampden counties. The MPO jointly develops, reviews, and endorses a Planning Works Program which includes a Unified Planning Works Program (UPWP); a Regional Transportation Plan (RTP); a Transportation Improvement Program (TIP), as well as any transportation plan or program that may be required by federal and state laws and regulations. The MPO is a forum for cooperative transportation decision making and will seek and consider the advice of any interested party in the Pioneer Valley. The Joint Transportation Committee (JTC) meets monthly to discuss transportation issues and makes recommendations on the Transportation Improvement Program (TIP), Regional Transportation Plan (RTP), and Unified Planning Works Program (UPWP) endorsements to the MPO. The MPO consists of ten members including: The Chairperson of the Pioneer Valley Planning Commission (PVPC); the Chairperson of the Pioneer Valley Transit Authority (PVTA); the Secretary of Massachusetts Department of Transportation (MassDOT) and the Commissioner of the Massachusetts Highway Department (MHD) and six local representatives. These six representatives must each be an Elected Official from a given community. See the full list of MPO members in the resources section of this page. 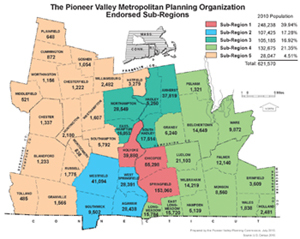 The Pioneer Valley Joint Transportation Committee (JTC) is the region's transportation advisory group for the Pioneer Valley Metropolitan Planning Organization (MPO). The JTC was established by the 3-C (Comprehensive, and Continuing, Cooperative) Memorandum of Understanding (MOU), which emphasizes a comprehensive, cooperative and continuing process for transportation planning and programming. The committee is designed to assist the MPO in incorporating citizen participation in transportation decisions which provides a mechanism for federal, state, and local input into the regional transportation planning process. Each member community is asked to appoint two representatives (a representative and an alternate) to the committee. The Pioneer Valley MPO also requests that other transportation organizations in the region appoint a representative to the JTC. The JTC meets monthly on the second Wednesday of the month, all meetings are open to the public and interested parties are encouraged to attend. Meetings are posted on this website. MPO staff will have an opportunity to comment on individual transportation plans, expectations, and concerns and incorporate them into the regional planning process. The planning program and the various functional elements of the planning process are developed cooperatively with the committee and ultimately reviewed by the committee prior to action by MPO. The JTC is responsible for coordination of all regional transportation related plans and programs in cooperation with PVPC staff.